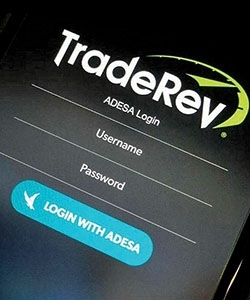 TradeRev-H, an enhanced version of ADESA’s TradeRev app for one-hour online auctions, seeks to tap machine learning to change how vehicle inspections are done. KAR Auction Services Inc. unveiled the enhancements to TradeRev, based in North York, Ont., near Toronto, in March before the NADA Show. KAR Auction Services Inc. in October 2017 acquired full ownership of the Canada-based TradeRev technology that allows dealers to electronically bid on and purchase used vehicles before they reach physical auctions. To indicate that the technology is groundbreaking, the “H” is for Grace Hopper, a U.S. Navy rear admiral credited with developing the precursor to the Common Business Oriented Language, or COBOL, computer- programming language. “For any digital remarketing channel, the visual condition report is key,” said Peter Kelly, KAR’s chief technology officer. Until now, that often has meant the use of third-party inspectors. TradeRev-H seeks to change that. It can take video from a vehicle walkaround, automatically create still photos showing parts of the vehicle and upload them in standard condition-report order and format. In addition, KAR is working to add damage detection. If a scratch or dent is large enough to matter, the video will zoom in for a closer look. After that, KAR hopes to be able to compare the extent of the damage against its database of damage costs, drawn from its Insurance Auto Auctions salvage-auction business, and factor that into the suggested pricing. Using machine learning, it seeks to predict the exact impact on auction prices of a major dent for a Toyota Camry vs. a Mini Cooper vs. a Mercedes-Benz E class.